A faraway object nicknamed "Snow White" is considerably larger than scientists had thought, and is in fact the third-largest dwarf planet in the solar system, a new study suggests. Snow White is about 955 miles (1,535 kilometers) in diameter rather than 795 miles (1,280 km) wide as previously believed, according to the new study. That makes it the largest still-unnamed object in our solar system, NASA officials said. (The dwarf planet has not yet been formally named and currently goes by the placeholder designation 2007 OR10.) NASA released a new video of the dwarf planet Snow White along with its new size figures. Fourth place belongs to Haumea, which is 1,195 miles (1,920 km) across in the longest direction but has an oblong shape and is therefore less voluminous than Snow White. The 890-mile-wide (1,430 km) Makemake comes in fifth, NASA officials said. However, there is some uncertainty surrounding Snow White's newly determined size; the object's diameter may actually be as large as 1,000 miles (1,610 km) or as small as 814 miles (1,310 km), according to the new study, which has been published in The Astronomical Journal. One of the people who discovered Snow White back in 2007, California Institute of Technology astronomer Mike Brown, urged people to take this uncertainty into account before giving the dwarf planet the third-place trophy. 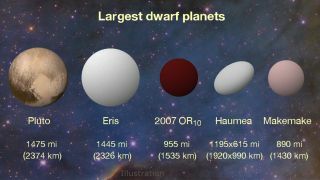 "Be a little skeptical that 2007 OR10 is the third-largest dwarf planet, please. It has the least well measured size. Could easily be [smaller than] Makemake," Brown said via his Twitter account, @plutokiller, on Wednesday (May 11). Snow White orbits the sun every 547.5 years on an extremely elliptical path, getting as close to the star as 33 astronomical units (AU) and as far away as 101 AU. One AU is the average distance from Earth to the sun — about 93 million miles, or 150 million km. For perspective, Pluto orbits the sun at an average distance of 39.5 AU, and completes one lap every 248 years. The size revision should help researchers better understand Snow White's composition and evolution, researchers said. For example, the object probably has an even darker surface than scientists had thought (because a larger amount of area is reflecting the same amount of light). Artist's illustration of 2007 OR10, nicknamed "Snow White." Astronomers suspect that its reddish color is due to the presence of irradiated methane. Previous observations had suggested that Snow White is reddish, perhaps because of the presence of methane ices. The new results bolster this interpretation, researchers said. "Our revised larger size for 2007 OR10 makes it increasingly likely the planet is covered in volatile ices of methane, carbon monoxide and nitrogen, which would be easily lost to space by a smaller object," lead author András Pál, of Konkoly Observatory in Budapest, Hungary, said in a statement. "It's thrilling to tease out details like this about a distant, new world — especially since it has such an exceptionally dark and reddish surface for its size." Pál and his colleagues studied observations of Snow White made recently by NASA's Kepler space telescope, as well as archival data gathered by the European Space Agency's infrared Herschel Space Observatory, which ceased operations in April 2013. But Kepler team members soon devised a way to stabilize Kepler's position in space using the two remaining reaction wheels and sunlight pressure, and the spacecraft embarked upon a second mission called K2 in 2014. Kepler is still searching for exoplanets during K2, but it's also studying a variety of other cosmic phenomena and objects — including Snow White. Kepler measured Snow White's reflectivity, and the Herschel data allowed the study team to determine how much solar radiation the dwarf planet absorbs and later radiates as heat. Combining the two types of information allowed the researchers to calculate Snow White's size, NASA officials said. The team also determined that the object is rotating extremely slowly, completing one spin every 45 hours. Snow White's surface brightness also appears to vary from place to place, researchers said. The dwarf planet 2007 OR10, nicknamed “Snow White,” as seen by NASA’s Kepler space telescope. Snow White may not be the biggest unnamed object in the solar system for much longer. "The names of Pluto-sized bodies each tell a story about the characteristics of their respective objects," Meg Schwamb, who discovered Snow White along with Brown and David Rabinowitz of Yale University, said in the same statement. "In the past, we haven't known enough about 2007 OR10 to give it a name that would do it justice," added Schwamb, who's currently at the Institute of Astronomy & Astrophysics at Academia Sinica in Taipei, Taiwan. "I think we're coming to a point where we can give 2007 OR10 its rightful name."